I can only imagine how incredibly delish the Nog must be. We only use So Delicious Coconut Milk,, it’s great for drinking and trying baking with it,, it’s amazing! If FB had a place to LOVE So Delicious, I would! 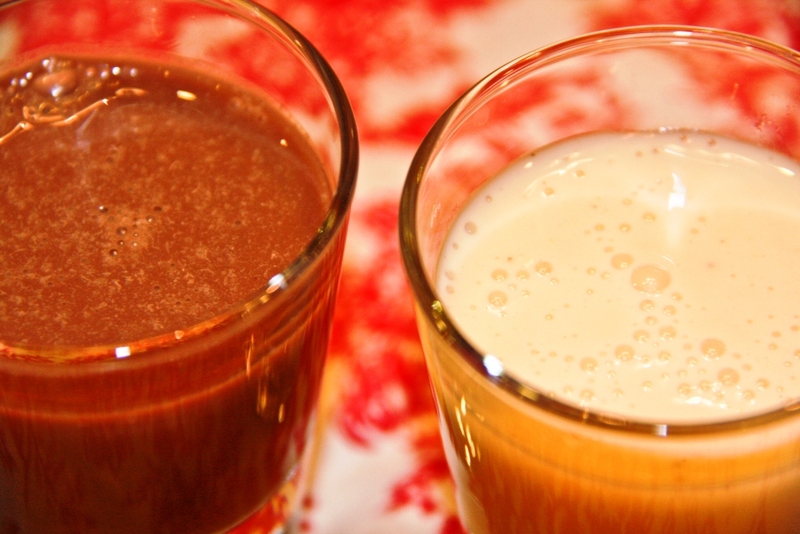 I am absolutely planning to try the eggnog, ESPECIALLY that french toast recipe! Thanks for sharing! I am a huge fan of their yogurt and regular milk, excited they are spicing it up (literally!) for the holidays! I like SO delicious and am excited to try both, for different reasons..but I love the flavor of both, so if I win, dealer’s choice!!!!!!!! They both look so good!! I would to try the coconut nog,I’m already friends on fb with so delicious for awhile now and following on Twitter! I will be looking for these when i go shopping!!! I already like them on FB! I’d love to try some of their cultured coconut milk yogurt. I liked So Delicious and can’t wait for the egg nog. I just say a show where they made egg nog pancakes that I’ve been wanting to try. I’ve “liked” their page! I’d LOVE to try the chocolate mint. It’s my favorite flavor combination! I just found the coconut nog at my local Whole Foods store. 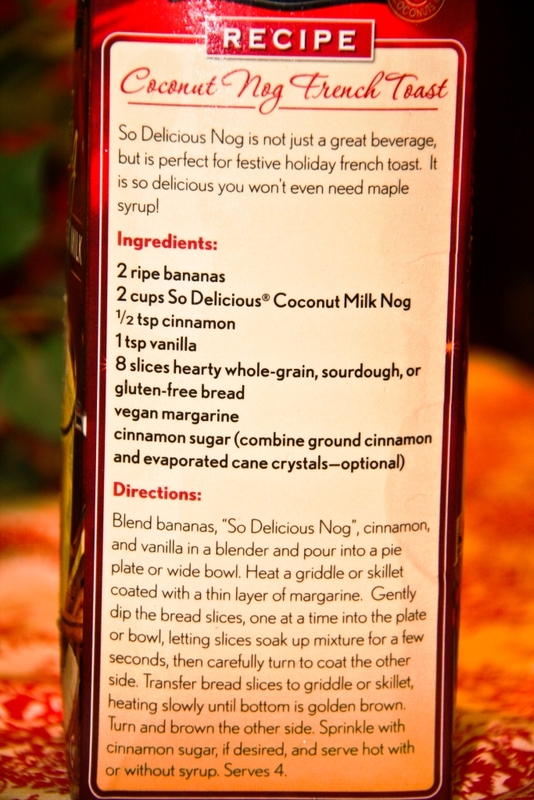 It is the BEST dairy-free nog (and maybe even the best any-kind-of nog) I have ever tasted! I couldn’t wait to make the French toast recipe. The kids and I agree that it is absolutely scrumptious. They want it for breakfast every day now. LOL! Thank you for the giveaway! I follow So Delicious on Facebook. Liked them on Facebook a bit ago and they have great posts. Both recipes sound fantastic, can’t wait to try them. I follow them on twitter and want to try the mint chocolate. I love me some mint and chocolate non-dairy beverage. 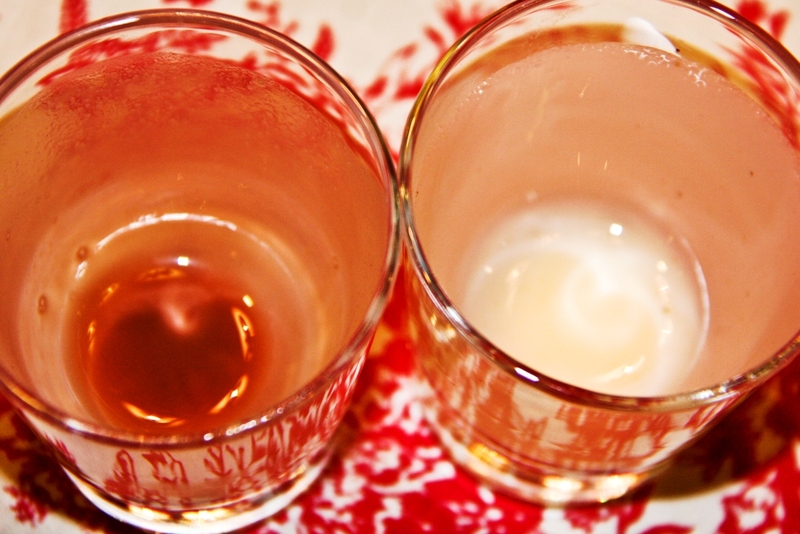 The Egg Nog flavor sounds great and there are so many recipes you could use it to make! I like So Delicious on facebook and follow them on twitter. Thanks! Ha, what timing- I just got this package of beverages, too! I haven’t tried mine yet, but now I’m even more excited. They seem promising! I already liked SoDelicious Coconut Milk on facebook! I’m already following Turtle Mountain on twitter! I realllly want to try the eggnog.. i think i’ve had eggnog ONCE in my life, but i don’t even remember! I just want to taste it and see what eggnog really tastes like! I ‘liked’ their page a while ago. Love the stuff and excited for some new flavors. Thanks! I would LOVE to try the coconut milk nog! My experience with vegan egg nog hasn’t been great so far, so I’m really excited about this. I hope it’s as delicious as all of their other products. I follow them on twitter. Hi, I’m a newbie to vegan living. I have been trying to convert the rest of my family. 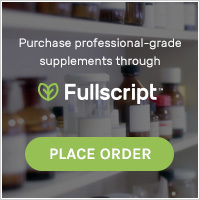 This new product you are promoting sounds wonderful. I look forward to finding it at the local (36 miles away) Natural Grocer’s. I bet I can incorporate it into yummy vegan desserts for my family. Thanks for sharing. oooh.. so totally looking forward to nog!! I liked the Facebook page. Thank you sooo much for sharing this I’m a huge egg big fan and I’ve been wondering what I would do without it. You saved the holiday! I liked their page on FB! I’m so excited to try the mint chocolate. I love hot chocolate and think that this would make a super delicious hot cocoa! It would also be great in coffee on crisp winter mornings! Liked So Delicious on FB! I would love to try mint chocolate, as would my little guy; I hope they come to a store near us!! Thanks for sharing. Wow! Until just now, looking for coupons for Boca burgers and (you know how searches can lead you to all sorts of places!) when I found your site as a link from somewhere! I didn’t even know about So Delicious coconut milk. 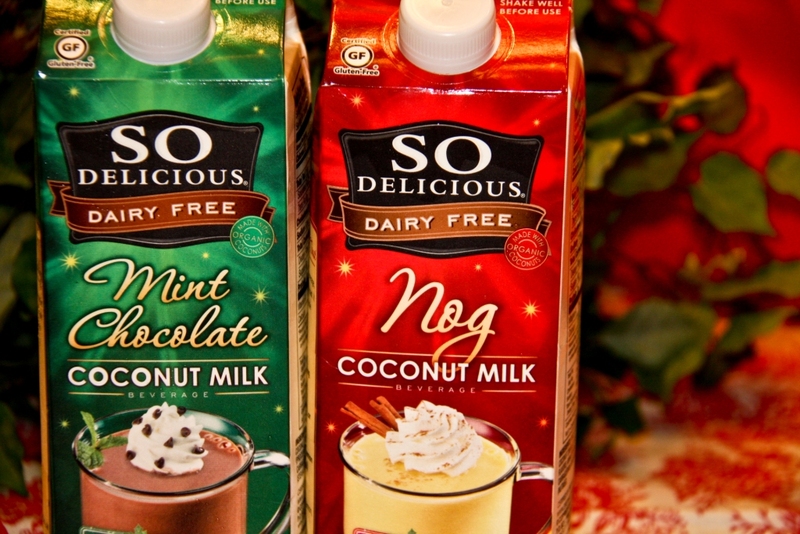 So to answer the questions and enter the contest, yes I went and ‘liked’ the FB page of So Delicious and I think both the regular coconut milk and the Nog ones sound truly wonderful! I adore coconut to begin with! Infact just about a week and a half ago I found a dried wide strip organic coconut at a local health food store that is so, ‘so delicicous’!!!! Not quite like fresh coconut, more like a candy! But it is just the goodness of the coconut itself!! I liked their page on FB and I cant wait to try the Nog along with the recipe on back. I think my hubby will love, thinking I will make for our anniversary brunch this weekend. Love. It’s my anniversary this weekend too! I like the FB page! 🙂 Fingers crossed. I used their regular coconut milk for my Thai Fried Rice and loved it! I “liked” them on FB and I actually do like or LOVE their products. I would love to try the Nog as I have seen the empty space for it on my grocery store shelf but each time I try it remains empty 😦 I will continue to keep my fingers crossed as Nog was a fond memory from my past. I just found out about this from the so delicious facebook page! I am really excited for the coconut nog and the mint chocolate topped with some whipped rice cream and a peppermint stick! Already like their facebook page. Very excited to try both of them!! I’d like to try the Mint Chocolate flavor. I too already like their facebook page. I am interested in trying their nog, though the mint chocolate sounds good too! I liked their facebook page and am very excited about the coconut nog,yum. I know my boys will go crazy over the chocolate mint though. 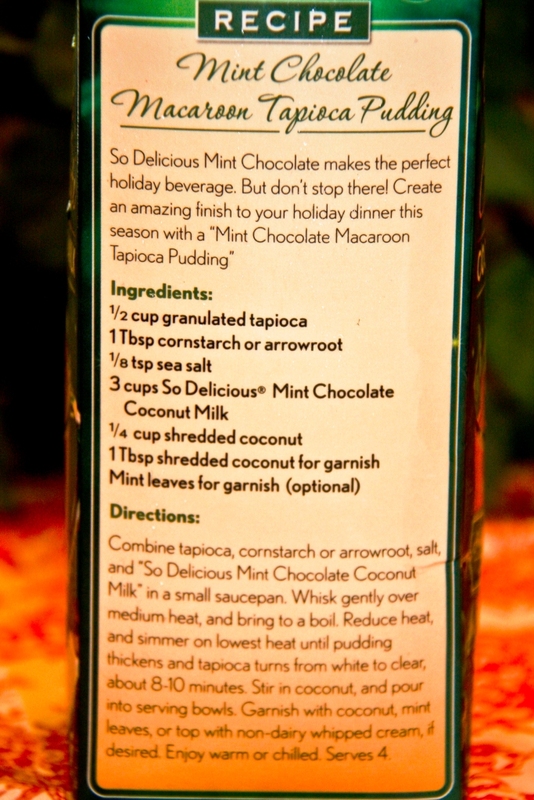 I liked the FB page and can’t wait to find and try the mint chocolate and nog!